The Mahomet Aquifer – the sole source for drinking water for over 750,000 of us in Central Illinois – is under threat of contamination from toxic chemicals. Champaign County Health Care Consumers (CCHCC) has joined the multi-county effort to protect the Mahomet Aquifer from contamination by a toxic waste landfill, and we need your help and support. The Clinton Landfill, owned by PDC/AREA Disposal, sits directly above the Mahomet Aquifer, and has created a new kind of dump in order to receive highly toxic, carcinogenic chemical wastes, including Manufactured Gas Plant (MGP) and polychlorinated biphenyl (PCB) wastes. We must take action!There is no greater environmental or public health threat facing Central Illinois than the possible toxic contamination of the Mahomet Aquifer. Clinton Landfill’s toxic waste dump poses a totally unacceptable risk to the Mahomet Aquifer and to the lives of hundreds of thousands ofpeople. One company’s profits should not be put above the health and well-being of our community and the precious natural resource upon which we depend for life-sustaining water. We can, and must, put a stop to this! I want to support legislation that will help protect our Aquifer! Please let me know when there is a call to action to support legislation that protects our Aquifer. I will add my voice to the effort by signing a petition, or contacting my legislator when asked to do so. I am interested in boycotting PDC/AREA Disposal! The Clinton Landfill is owned by PDC/AREA Disposal, which also provides residential and commercial garbage hauling services. I currently use PDC/AREA or Klean Way for my hauler, but I pledge to change hauling companies and boycott PDC/AREA. I do not use PDC/AREA as my hauler, but please add my name to the list of residents supporting the PDC/AREA Disposal boycott. 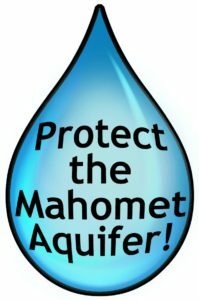 Make a contribution to CCHCC to help support our efforts to protect the Mahomet Aquifer. This work will require massive outreach efforts, including the costs of materials and staff time. Copyright © 2018 Champaign County Health Care Consumers. All rights reserved.